The Pocket Box is an ultra compact and lightweight AIO vaporizer that easily fits in the palm of your hand. It has a maximum 40 Watt Output. The coils give amazing flavors and clouds. This device is great for both sub-ohm DTL and MTL vaping. Ultra-Fast 0.02s push Button to Vapor response time. And a Grip-textured rubber diamond button. 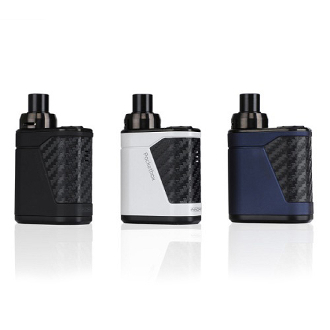 The tank features an Adjustable Airflow with a 2ml glass tank. Changing the coils in the Pocket Box ‘Top-down’ is Easy, Quick & Clean.